The new versions of iOS zoom into a wallpaper image when it is set as the wallpaper on both the lock screen and home screen of an iPhone, iPad, or iPod touch, effectively resizing the image. While this can make efficient use of some sized images and look great with certain types of pictures, the zooming wallpapers do not look so great with portraits, group photos, and just pictures of people or multiple subjects in general. While there’s no direct way to stop the zooming, there’s a little workaround trick you can utilize to stop the wallpaper image from being zoomed into on an iPhone or iPad, here’s how it works. 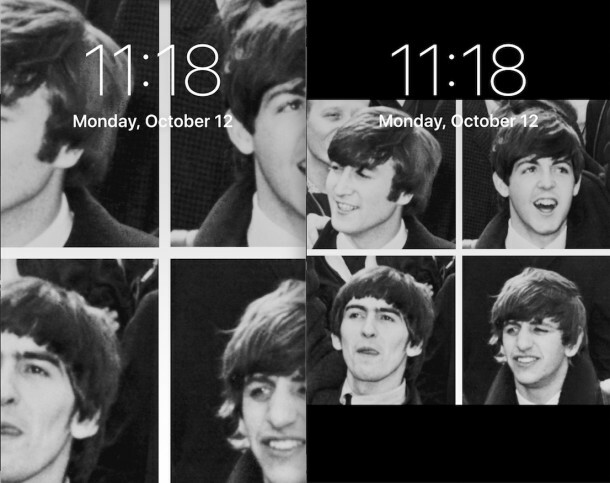 For this example walkthrough, we’ll use an iPhone and set this picture of The Beatles from UPI Wikipedia commons as the wallpaper, since most people who have bothered by the wallpaper zooming feature in iOS encounter it when using a group picture of people. Now locate the screen shot of the picture you just created in Photos app Camera Roll, tap on it, choose the Sharing button, then choose “Set As Wallpaper” – no more zooming! While this prevents the wallpaper picture from being zoomed in on, the obvious downside is that you’ll have a black border on the image. The before and after seen above demonstrates how dramatic the difference is, with the prior picture so zoomed in you can’t see half the faces, whereas the screenshot image is appropriately sized with no zoomed effect. You can see the effect by hitting the Power button once the wallpaper has been set to enable the lockscreen. Note this is not the same as turning off the face-zoom feature on the iPad picture frame. This is obviously very much a workaround, but it’s necessary for now until (if) iOS changes the way that wallpaper images are handled. The zoomed wallpapers have been in place for multiple major versions now, so don’t expect a change anytime soon. For now, just take a screenshot of the picture on your iPhone, iPad, or iPod touch, and use that as the wallpaper instead, no zooming. Thanks. Interesting solution to the wallpaper zoom issue on iPhone, which has been around since Apple made iOS look like a solar reflector. I have always been surprised they didn’t introduce various framing options for pictures, because surely many people want to set family shots and horizontal pics as their lock screen, but inevitably the people who are not centered in the photo get cropped out! Not very family-friendly, Apple! That would be nice, but for now I will use this method for the family pics! Thank you so much! This zoom function drove me nuts. I liked the old wallpaper sizing on iOS much better. In my opinion, the zoom is the result of one person’s input. I strongly suspect that Steve Jobs would have spotted this and vetoed it. Actually, there are too many clicky features recently which I am sure Steve Jobe would have vetoed. Hey, Apple, please try to hew the purist path. I’m so glad I stayed on iOS 7.1.2 with my iPhone 5. Works. I can totally resize or “unzoom” any pic when I set the wallpaper. I can’t believe they took that ability away! I think Steve Jobs is third on the left,before the byrds one? I have tried different pic sizes and almost gave up. This one simple solution worked. Finally! Nice work guys; makes life a little easier. Bro you Rock// you saved me a huge headache!! My girlfriend has been trying to scale this image of us for her lockscreen for the last 10min and interrupted my evening football, but you came through in the clutch; Kobe! This doesn’t work. On the latest iOS it always zoom because when u set the wall paper you have to set it in portrait orientation and when phone rotates to landscape it takes whatever was in portrait rotate it and zoom. No matter what size is the original will be cropped to portrait first during setting the wallpaper so this fix doesn’t work. I’m absolutely annoyed at apple for this new feature. Nevertherless, Thank you so much! It works! Which photos app r u talking about?? Thank you for this fix! The zooming was so irritating and I tried cropping in different apps and nothing worked. Thank you so much! I was so upset on this issue as I have so many lovely pics in my library but I wasn’t been able to resize them up to the screen format! Great solution! Dude, you are a genius. It was frustrating the crap out of me. Thank you! Awesome tip. Thank you so much! GENIUS! I’ve been trying to re-size a photo for wallpaper for a week now. Thank you! GENIUS LEVEL HACK! thank you. Hack still works in 2019. Many thanks for showing how to get round an annoying Apple problem. Just tried this and it did nit work on my new iPhone 8 plus. Is there another way to sop the awful zoom? Ellie, if you take a screenshot of the photo when it is zoomed out and use that zoomed out image screenshot, it will work on the Plus size iPhone model.